Waikoloa Beach Villas 1501. Two Bedrooms and newly remodeled in 2018! 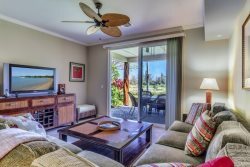 Waikoloa Colony Villas 1501 is a beautiful two-bedroom, two-bathroom vacation villa that was just remodeled; the perfect getaway for friends and family accommodating up to six guests. An inviting spacious living room featuring Koa laminate floors, vaulted ceiling, plenty of natural lighting through the multiple large windows, as well as access to the lanai’s outdoor seating where you can enjoy meals in the warm tropical breezes. The living room’s furnishings include a high-quality sleeper sofa, large comfy recliner chair, flat screen TV and DVD player. Cable television and high-speed wireless internet is included throughout the home. The living room is open to the kitchen which comes equipped with numerous appliances; basic cookware, dishware, drinkware, and coffee maker. Kitchen includes a dining table with seating for six as well as seating for two more at the kitchen bar. The master suite offers its own private patio and en-suite bathroom with double sink, soaking tub, and shower. The downstairs guest suite features Koa laminate floors and two twin beds. For any extra guest, there is the high-quality sleeper sofa in the living room. The unit includes a washer and dryer located just off the kitchen. Home includes central AC (note: AC is set to 74 degrees Fahrenheit in all units) as well as ceiling fans in all bedrooms for your added comfort. All of our vacation rentals include a basic “start-up supply” of: laundry detergent, garbage bags, kitchen sponge, liquid soap, dishwasher tabs, paper towels, toilet paper, shampoo/conditioner, small bar soap, and salt/pepper. Cooking oils and spices are not provided. Once the startup supply runs out, guests are on their own to purchase additional supplies if needed. Cleaning solvents are not supplied. Waikoloa Beach Resort is a pedestrian friendly resort with 2 outdoor shopping centers, Queen’s MarketPlace and King’s Shops. Hilton Waikoloa is about .7 mile and The Marriott Waikoloa is about a 1 mile walk or 5 minute drive. Enjoy the white sand beach of Anaeho’omalu Bay – right next to the Marriott which offers many water-sports; windsurfing, swimming, sailing, snorkeling, glass-bottom boat, dive trips, whale watching trips, etc. Further down the road (roughly a 15-minute drive) are other beaches such as 49 Black Sands, Beach 69 (at mile marker 69) Hapuna Beach and the world famous Mauna Kea beach.